For the Preach! 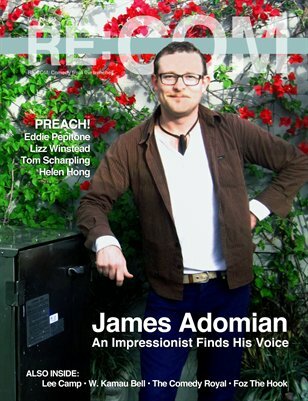 issue of RE:COM, which tackles the idea of having a message behind the jokes, we interviewed comedy greats James Adomian, Tom Scharpling and Eddie Pepitone, went on tour with Daily Show creator Lizz Winstead and heard from rising stars W. Kamau Bell, Lee Camp and Helen Hong. The issue also includes insights on sharing a message from up-and-coming comedians across the country.